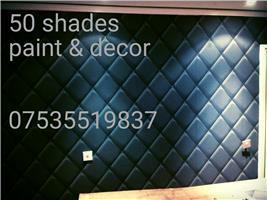 50 Shades of Paint & Decor - Painter/Decorator based in Ashton-under-Lyne, Lancashire. Hi, I'm Danny from 50 shades of paint & decor where we pride ourselves on making your house a home. We provide a range of services to make your project the best possible of finishes including all aspects of interior and exterior painting with only the best products for a long lasting finish using dustless sanding to keep your home as clean as possible throughout the process and for bigger projects airless spraying. Always happy to recommend different types of paints, finishes and ways to complete your project to the highest of standards at a competitive rate. I've been a painter and decorator for 10 years and treat every job as if I was working in my own home.